We spent one night in the RV lot. It cost $15.00 but included use of the laundry, bathrooms and showers which were very clean and warm on a cool morning. We were also allowed to use a dump station at any vacant lot. The RV lot is hard gravel and level. 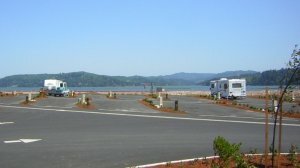 The RV resort is located on Coos Bay. Very pretty sunrise. I recommend staying here.